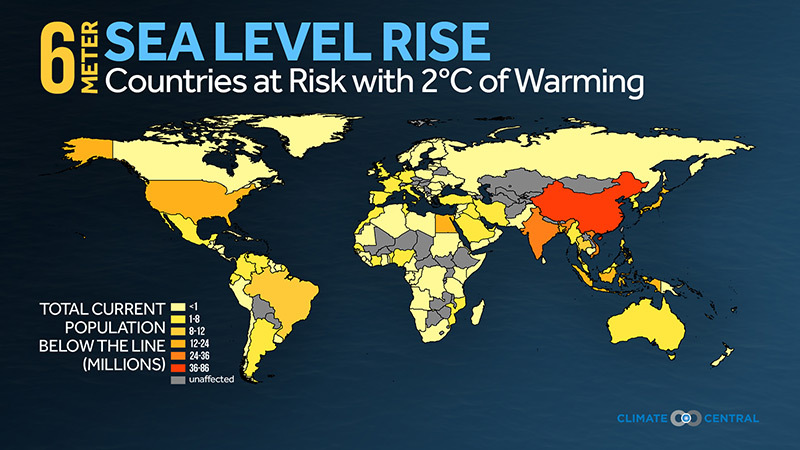 By trapping heat, rising concentrations of atmospheric pollution are causing glaciers and ice sheets to melt into seas, lifting high tides ever higher. Globally, average temperatures have risen about 1°C (nearly 2°F) since the 1800s. Last year was the hottest recorded, easily surpassing the mark set one year earlier. The expansion of warming ocean water was blamed in a recent studyfor about half of sea level rise during the past decade. Changes in sea level vary around the world and over time, because of the effects of ocean cycles, volcanic eruptions and other phenomenon. 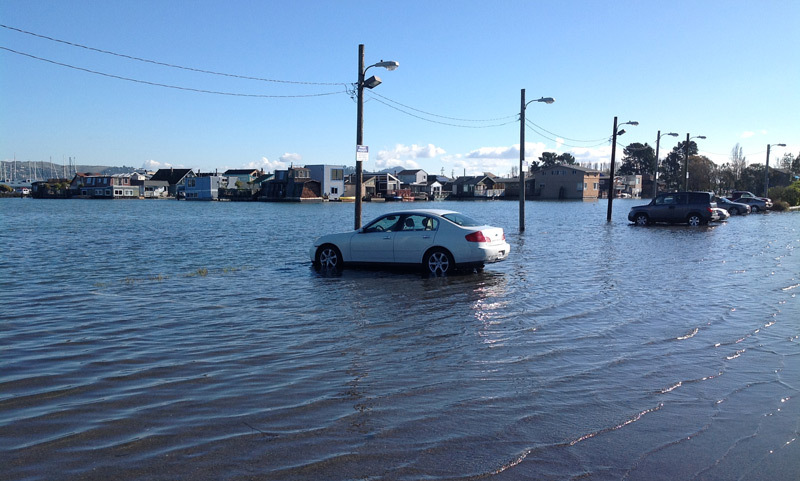 But the hastening pace of sea level rise is being caused by climate change. Were it not for the effects of global warming, the researchers concluded that sea levels might actually have fallen during the 20th century. At the very least, they would have risen far less than was actually the case. 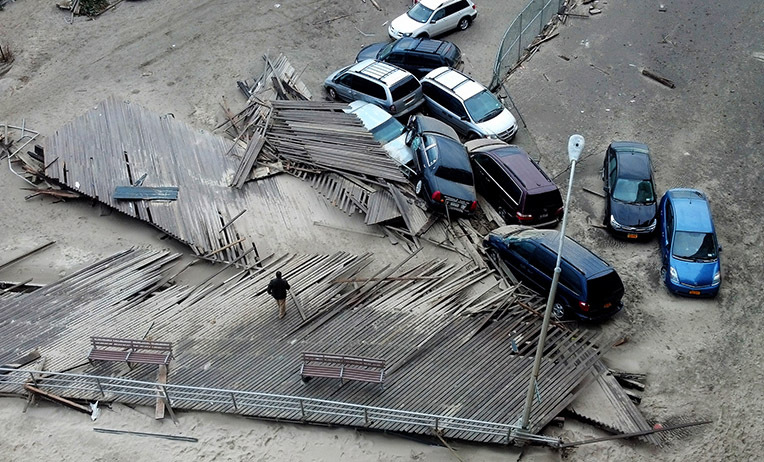 A report published by Climate Central on Monday, the result of an analysis based in part on the findings in Monday’s paper, concluded that climate change was to blame for three quarters of the coastal floods recorded in the U.S. from 2005 to 2014, mostly high tide floods. That was up from less than half of floods in the 1950s. 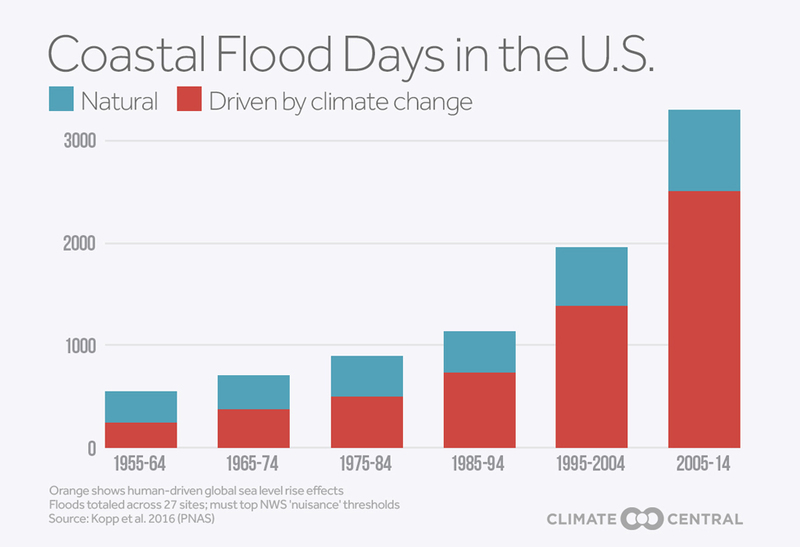 “I think this is really a first placing of human fingerprints on coastal floods, and thousands of them,” said Ben Strauss, vice president for sea level and climate impacts at Climate Central. Strauss led the analysis, which also involved government and academic researchers. Governments and communities have been slow to respond to the crisis of rising seas, though efforts to adapt to the changes underway are now being planned around the world. A high-profile effort to track long-term changes in sea levels was based on analysis of sediment layers at a single location in North Carolina. Published in 2011, that study produced a chart of sea levels that bounced up and down over time, changing with global temperatures, and then ticked sharply upward as industrialization triggered global warming. “North Carolina basically showed us that this could be done,” said Andrew Kemp, a sea level scientist at Tuft’s University. He was a co-author of both Monday’s paper and the paper published in 2011. Monday’s paper combined the data from North Carolina with similar analyses from 23 other locations around the world plus data from tide gauges. 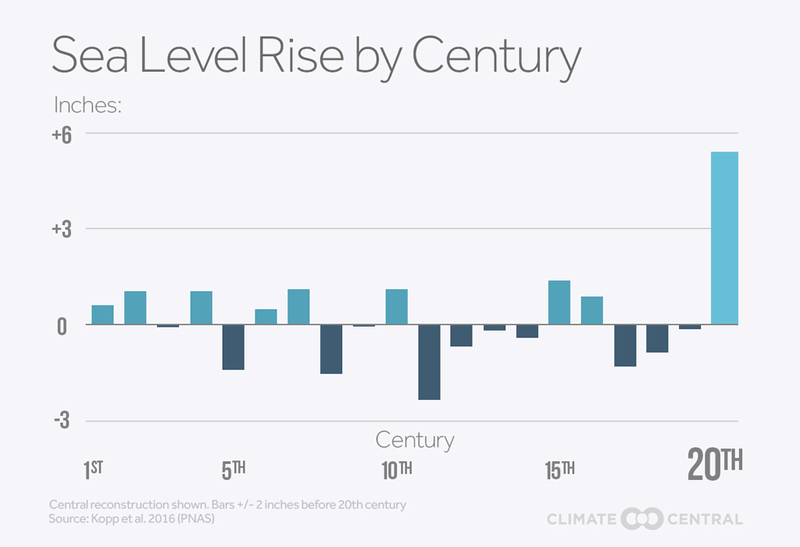 The analysis goes further than explaining historical sea level rise. It includes worrying projections for the future. By extending their findings to future scenarios, the scientists showed that the amount of land that could be inundated in the coming years will depend heavily on whether humanity succeeds in slashing pollution from fuel burning, deforestation and farming. The Paris Agreement negotiated in December aims to do just that, with nations agreeing to take voluntary steps to reduce the amount of pollution they release after 2020. It could take decades, though, before that untested approach is revealed to have been a success, a failure, or something in between. Even If humans quickly stop polluting the atmosphere, potentially keeping a global temperature rise to well below 2°C (3.8°F) compared with preindustrial times — a major goal of the Paris climate agreement — seas may still rise by an additional 9 inches to 2 feet this century, the study concluded. That would trigger serious flooding in some areas, and worsen it in others. Under the worst-case scenario investigated, if pollution continues unabated, and if seas respond to ongoing warming by rising at the fastest rates considered likely, sea levels could rise more than 4 feet this century alone, wiping out coastal infrastructure and driving communities inland. The problem would be made far worse if the Antarctic or Greenland ice sheets collapse — something that’s difficult to forecast. Their projections for future sea level rise were similar to those published in 2013 by scientists convened by the United Nations, following the Intergovernmental Panel on Climate Change’s most recent assessment of climate science. They also closely matched projections that were coincidentally published in a separate paper in the same journal on Monday. The similarity of the other papers’ projections “strengthens the confidence” in the findings, said Robert Kopp, a Rutgers University climate scientist who led the analysis. 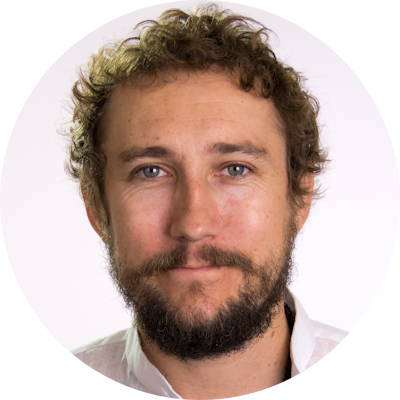 The convergence of the findings in Monday’s papers was a “nice result,” said Matthias Mengel, a researcher at at Potsdam University who coauthored the other sea level rise study released Monday. He led a team of sea level scientists who took a different approach than Kopp’s team to projecting future sea levels. Mengel’s team projected future sea levels by combining the results of models that anticipate changes to icebergs, ice sheets and ocean expansion in the years ahead, and used those findings to predict sea levels. For years, different approaches to projecting future sea level rise have arrived at different results, but the gap has recently been closing, which Mengel described as “a really good sign for sea level science” — even if it’s ominous news for humanity.